Eastern Sierra at it's very best, every autumn season. The first dusting of snow is usually October. It's high country scenery without the crowds... even a paved loop! Just north of Mammoth, June Lake California is smaller, less crowded, has great day hikes w/ lakes and creeks nearby. Fish Reverse and Rush Creek this fall! 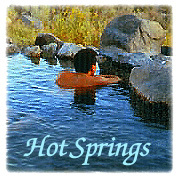 Naked people: mountain bikers, kayakers, fishermen, backpackers, hikers, hippies - everyone loves California's selection of natural, hot mineral springs. From posh resorts at the coast, to 1950's bath houses in the desert, to hike-in-only rock tubs on the rivers edge, the west coast has it. Explore the back roads of CA for seclusion. High Sierra aspen groves, mountain peaks, streams and pure autumn bliss - south of Lake Tahoe. 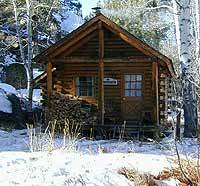 Awesome cabin rentals, restaurant, hiking and plenty topo maps and fishing creeks. Extreme elevations, meadows, crisp fall air. Hope Valley California - yep, you found it right here at Total Escape, with all the other worthy finds.